On Thursday, 10-18 at 10:18 a.m., some in Canby dropped to the ground as they participated in an earthquake drill called the Great Oregon ShakeOut. The Great Oregon ShakeOut is part of the larger Great ShakeOut Earthquake Drills, which tabs itself the world's largest earthquake drill. Canby Fire sent out information to the Chamber of Commerce to garner participation, and was in conversation with the schools. Due to elementary and middle schools having Thursday and Friday off, some schools held their drills on Wednesday, Oct. 17, and some held drills on Oct. 23. But on Thursday, people at Canby Fire, DirectLink and Canby High School all dropped to the floor and took cover at 10:18 a.m. According to ShakeOut, if you are in a building during an earthquake, the best steps are to drop to the ground before the earthquake drops you, take cover by getting under a sturdy desk or table and hold on until the shaking stops. People are encouraged to stay indoors until it is safe to exit. Then evacuate. 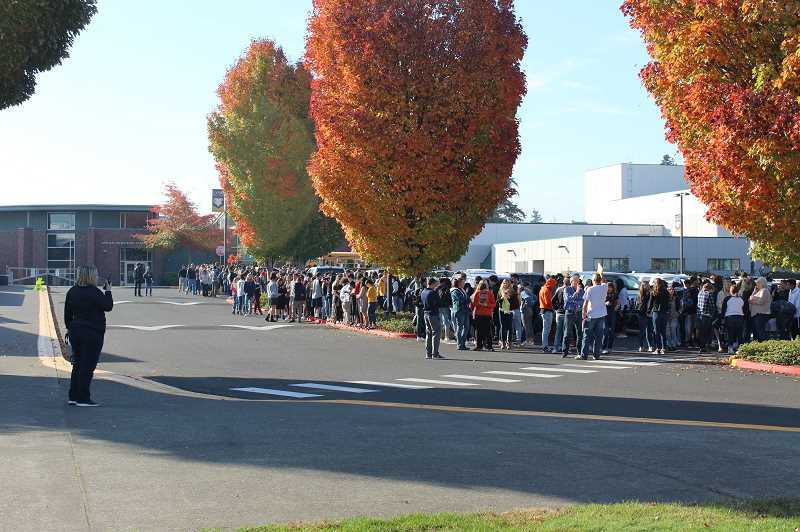 Everyone that was inside Canby High School Thursday followed that procedure. Canby Fire too followed their earthquake protocol, which is first to take cover like everyone else. Once the shaking stops, they spring into action. Crews go out and survey the area to check for damage and to establish response priorities. Then, they visit the schools and large businesses. "Schools are a priority," said Canby Fire's Battalion Chief Todd Gary. "That's where we've got the most amount of people is in the schools." So after the "shaking stopped" Thursday, Gary quickly left the fire station to visit the high school, where everyone had made it outside and teachers and staff were taking attendance. If a real earthquake were happening, the schools would then make plans to reunify students with their families. By the time Gary returned to the fire station, crews had set up an emergency operations center, with tables, communication equipment and several teams including a planning team in conversations with a logistics team and even ham radio operators. Canby Fire takes the drill seriously, because the threat is serious. The Cascadia Subduction Zone, a 600 mile long earthquake fault, sprawls from California, through Oregon and into Southern British Columbia, according to ShakeOut. The Juan de Fuca and North America Plates push against each other, building stress for hundreds of years. When they finally rip apart, they create some of the largest earthquakes and tsunamis on earth. Oregon also experiences crustal earthquakes, per ShakeOut, which account for the two largest Oregon earthquakes in recent years. For more information on earthquakes in Oregon, visit Oregon.gov/oem.